In 1990, enrollment surpassed 5,000 students for the first time. At the recommendation of President James Long, in 1993, the Board of Trustees voted to convert Cincinnati Technical College to a state community college. The name was officially changed to Cincinnati State Technical and Community College in September of 1994. This logo appeared in 1994. Does it seem to convey a sense of direction to you? Cooperative education has always served as the hallmark of the institution’s philosophy, so advertising efforts in the 90s strove to balance the school’s long held brand of “learn and earn” with the newly offered Associates degree. This radio ad announces the name change and establishes the newly-offered Associate’s of Arts, or Sciences, as an inexpensive alternative to the first two years of a four-year degree, a first for the college. The video above, “College of Choice”, 1994, emphasizes Cincinnati State as an affordable gateway to a career. The college made national headlines appearing on the front page of The Wall Street Journal March 19, 1993. The article discussed the success of the co-op education plan in Cincinnati, where Cincinnati Technical College had a placement rate of 98% for co-op grads. These newspaper ads convey the new message of “choice”, that a student can choose to earn a 2-year degree in a technical trade, or transfer their credits from an Associate’s Degree to a 4-year institution. 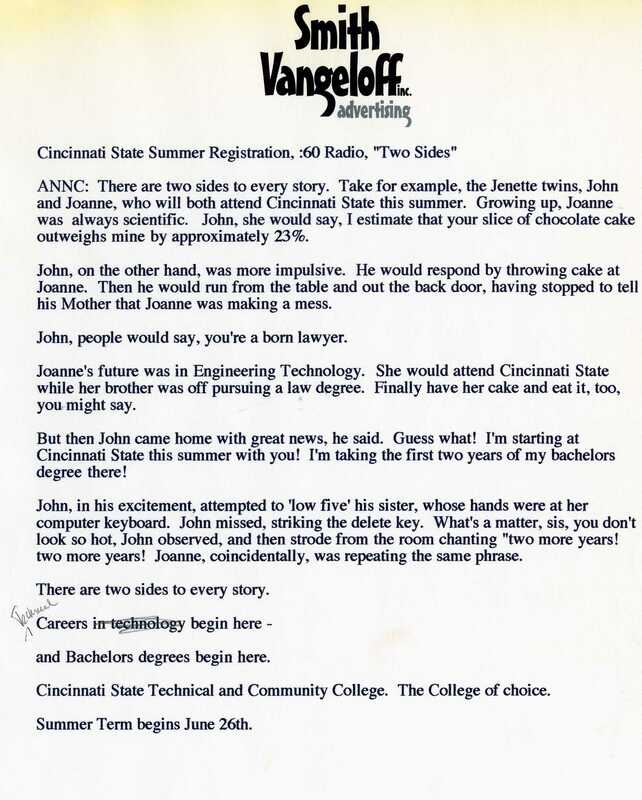 (Above) A transcript and the recorded radio ad from 1994 (below) conveying the “two sides” of Cincinnati State: training for a career or heading toward a bachelor’s degree. The photo at left, typical of the college’s promotional photos, shows a student at work in their field. 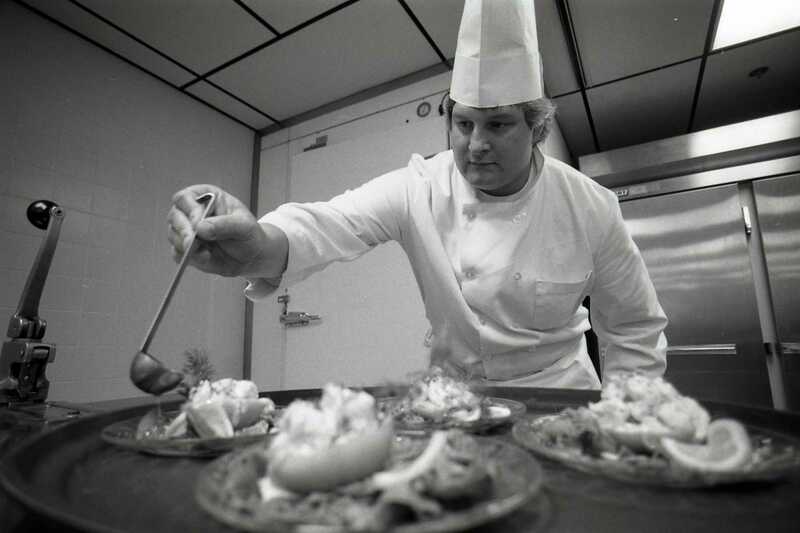 In this case, the student spends class time in the Chef Technology kitchen. In the gallery below, students demonstrate work in their respective fields.